How did humans and all life around us evolve? The diversity of life forms today amounts to several millions of species and understanding the origins of biodiversity and how it changes over time is a major challenge in evolutionary biology.To fully answer such questions, biologists and palaeontologists aim to quantify speciation and extinction rates, that is, the pace at which new species appear and disappear throughout the history of the Earth. Palaeontologists obtain these rates by looking at stratigraphic ranges, i.e. the ages of different species in the fossil record. The distribution of fossil species over time provides information about changes in rates of speciation and extinction. Biologists obtain these rates by looking at dated phylogenetic trees, i.e. subtrees of the tree of life with calendar dates assigned to branching events, which are generated from the genes of living species. The branching events in these trees provide information about speciation. Perhaps surprisingly, the distribution of branching events in a tree of living species also provides information about extinction, even though these trees contain no extinct species. 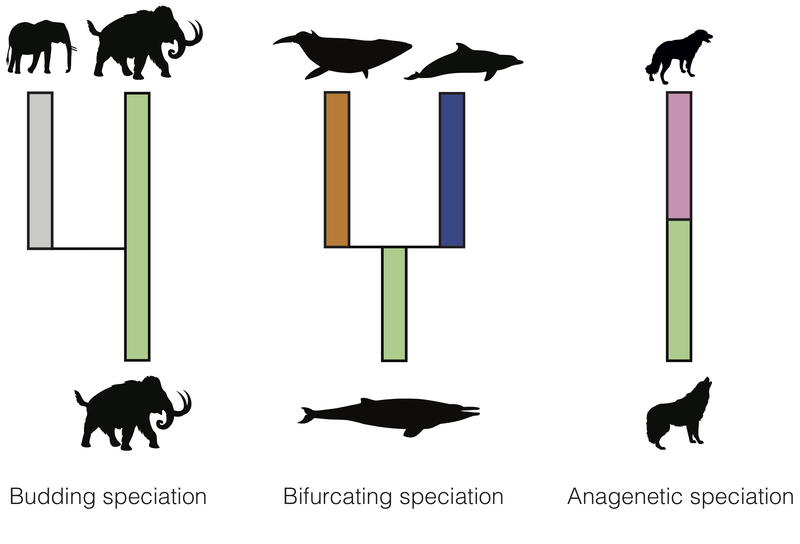 Although we know that fossils and living species share the same evolutionary history, the analysis of stratigraphic ranges and phylogenetic trees frequently produces conflicting results. For example, if we look at the evolutionary history of the mammalian clade Bovidae (which includes bisons, buffalos, goats, and domestic cattle) we find that speciation and extinction rates inferred from the fossil record are significantly higher than those inferred from the phylogenetic tree of extant species (Fig. 1). In general, palaeontologists tend to estimate much higher rates of extinction than biologists for the same groups of species. Fig. 1. Phylogenetic estimates of speciation (blue) and extinction (red) rates for bovids plotted against the respective fossil estimates. On the right a fossil skull of the extinct steppe bison (photo by M. Silvestro) and the modern European bison. Why? Previously, researchers have pointed to sampling biases of both fossil and living species, or problems determining what constitutes a species in the fossil record, while others have claimed that it is not possible to obtain information about extinction millions of years in the past from trees of living species. These claims suggest there are problems with our data, our models or both. We took a step back, and asked: do we actually make the same assumptions when we analyse fossil versus phylogenetic data? We show in our paper that the answer is no. Put simply, palaeontologists count how frequently stratigraphic ranges appear and disappear during different geological intervals. The end points of stratigraphic ranges provide evidence that a new species has appeared and later disappeared, but without any other information, the age of first and last appearances says nothing about how that species evolved or became extinct. There are different modes through which new species can emerge (Fig. 2): (1) in budding speciation the ancestor gives rise to a single new species and continues to evolve, (2) in bifurcating speciation the ancestor gives rise to two new species and disappears, (3) in anagenetic speciation the ancestor gives rise to a single new species and disappears. In addition to the disappearance of a species due to bifurcating or anagenetic speciation, a disappearance can occur through extinction without replacement. Fig. 2. Hypothetical examples illustrating the three speciation modes considered in our model. On the other hand, in phylogenies, we simply track the branching events, which essentially only allows to quantify the pace of branching speciation, without explicitly modelling extinction of the ancestral species. Thus, bifurcating speciation and budding speciation appear as branching speciation in the phylogeny, only extinction without replacement is explicitly modelled, and anagenetic speciation is not modelled in the phylogeny at all. Based on these observations, it becomes clear that paleontological speciation and extinction estimates have the potential to be higher than phylogenetic speciation and extinction rates, simply because the latter never considers the speciation and extinction events that occur through bifurcation and anagenesis. In our paper (1), we derive formulae and present a new model that links palaeontological and phylogenetic diversification rates. We analyse fossil and phylogenetic data for a range of animal and plant groups and show that using these formulae we can overcome the conflict in rate estimates observed for a range of organisms, such as the bovids mentioned above, the penguin bird family, the plant group ferns, and several other lineages. 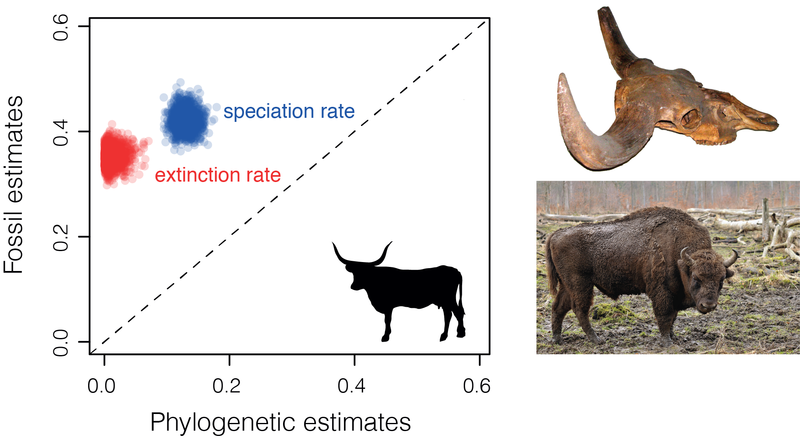 The properties of our model also allow us to determine the prevalence of different speciation modes, showing that the discrepancy between fossil and phylogenetic rate estimates can in fact be informative of the underlying diversification process. In a recent paper (2), C. Marshall proposed five palaeobiological laws essential for understanding the evolution of the living world, with an emphasis on the importance of the balance between speciation and extinction in shaping biodiversity through time. We propose the recognition of the differences between palaeontological and phylogenetic models of speciation and extinction, as formalized by our equations, as the sixth law of palaeobioloy. Only by accounting for the impact of different speciation modes can we unify fossil- and tree-based models of speciation and extinction. (2) Marshall, C. R. Five paleobiological laws needed to understand the evolution of the living biota. Nature Eco Evo 1, doi:10.1038/s41559–017–0165 (2017).